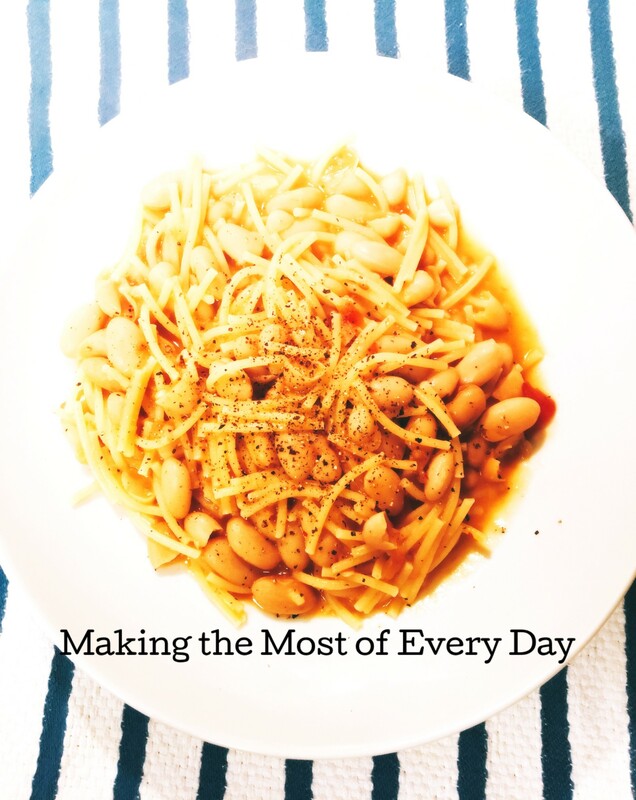 You might be familiar with today’s recipe, Pasta e Fagioli (pasta and beans), from the Olive Garden. My recipe is NOT a copycat recipe. This classic, Neapolitan dish utilizes inexpensive ingredients to make a delicious, filling meal! This version contains no meat and only white beans. This is *THE* recipe that captured my husband’s attention before we were even dating. He was helping my at-the-time boyfriend work on his car. I was inside my little apartment cooking lunch. Since it’s easier to make this for two to three people than it is for one person, I stuck my head outside and asked if they were interested in lunch. As Michael tells it, he thought: “Man, this guy is lucky to have a girlfriend who can COOK!” Little did he know that he would one day marry me! I’ve made this for him many times since! Start with a swirl of extra virgin olive oil. Heat, then add garlic and celery and after a minute or two, the tomato. Saute for a little bit and then add the beans. Add water to cover. In the meantime, break up half of box of spaghetti into one inch lengths. When water is boiling, add spaghetti and season with salt. NEVER add salt at the beginning; it will harden the beans. Stir, stir, stir to prevent pasta from sticking to the bottom of the pan. When pasta is al dente and water has mostly evaporated it is done. It should be soupy but not watery. If it’s getting too dry, add some water. Serve immediately with diced onion and sprinkle with black pepper. If you like this recipe, check out these similar dishes: Pasta e Patate and Pasta e Piselli. I’ve never heard of this one! My mother talks about how she was raised on pinto beans and cornbread, and my dad on red beans and rice… so it makes sense there would be a white beans and pasta variation for a cheap and filling meal. It looks like something my kids would love. I’ll have to tell them about it. My dad was raised on pinto beans and cornbread! My Italian mamma learned to make it so I was raised on it too! Love it! *and* red beans and rice! I learned that one when I was already married though. Dad didn’t like rice so we didn’t get it very often.